COOLANGATTA, AUSTRALIA (Tuesday, 22 December, 2009): Aussies Mick Fanning and Stephanie Gilmore may be the toast of the surfing world having wrapped up the men’s and women’s World Titles in Hawaii, but the focus now shifts to South Africa’s fledgling junior stars to see if they can make history by claiming the world’s premier junior surfing event – the 2009 Billabong ASP World Junior Championships fuelled by Monster Energy – due to take place at Sydney’s North Narrabeen beach over eight days beginning January 9, 2010. The winners will be crowned alongside Fanning and Gilmore at the ASP World Champions banquet on Queensland’s Gold Coast next February, and the South African contingent will certainly have their work cut out for them if they are to emulate the success of Jordy Smith who famously dominated the event to claim victory in 2006. Klee Strachan (Winkelspruit) enters the competition as one of the country’s favourites, thanks to a string of excellent results during the season and a top-4 finish in the ASP Africa Pro Junior rankings that has secured the 20 year-old a seed directly into the main event. “Last year I made round three but got knocked out by Julian Wilson (AUS) who is an unbelievable surfer so I was not too bummed,” said Strachan. “It’s an awesome event and all the surfers in the contest surf really well. I am definitely looking to do well this year. I’ve had three years to see how the standard is so I’ve been training to do well,” he added. Four of the country’s hottest juniors will join Strachan at North Narrabeen in the 48-man field; they include ASP Africa Pro Junior champion Chad Du Toit (Durban), Casey Grant (Scottburgh), Beyrick de Vries (Umhlanga) and Kyle Lane (Durban). This will be Strachan’s third appearance at the event. Having competed in the prestigious tournament last year when Hawaiian Kai Barger (Maui) went on to win in an all-international finals showdown versus Brazilian Jadson Andre (Natal City), he reflects on the 2009 showdown. “All the other SA guys are always amped to do their best and all of them can perform at world class standard on their day. Every surfer who has done well at Narrabeen has made their name from it and only gone on to bigger things and I’m pretty sure we’re each capable of going all the way and winning it,” Strachan added. One only has to look to Men’s ASP World Champion elect Mick Fanning (Gold Coast, QLD, AUS) however, to realize the enormity of the task at hand for the fledgling juniors. Despite having two ASP Men’s world titles to his credit, Fanning could never claim the prestigious junior crown. “I never got one … it’s a tough title to win,” said Fanning, whose best result was a runner-up finish to compatriot Joel Parkinson in 2001. Mick’s pick for 2009? Explosive 19 year-old Aussie goofy-foot, Owen Wright (Lennox Head, NSW). “Owen is World Champ material if you ask me. I’ve watched him evolve over the years and he’ll be the man to beat at the World Juniors for sure, provided he’s recovered from some heavy injuries suffered during the Portugal World Tour event,” said Fanning. Sarah Baum (Athlone Park) and Bianca Buitendag (George) will represent South Africa in among the 18-strong girls division and the super-talented teenagers have a good chance of wrestling the world’s most prestigious junior title from defending event champion, Pauline Ado of France. Ado last year halted the streak of wins by Australian females who have dominated the division since its inception in 2005. The Billabong ASP World Junior Championships fuelled by Monster Energy mirrors the competition format of the ASP World Tour and is considered the sport’s ‘crystal ball’ for aspiring champions. In addition, a finals placing in the tournament affords the successful surfers an unrivalled seeding on the World Qualifying Series that serves as a springboard to the ASP World Tour. Eight world regions are represented in all, including North and South America, Europe, Australasia, Africa, Japan, Hawaii and various wildcards. The Billabong ASP World Junior Championships is being made possible thanks to the support of MONSTER ENERGY,SONY, VW, VonZipper, VIRGIN BLUE, Warringah Council, Surfing NSW, NSW Sport & Recreation, ASL Magazine and HONDA Aquatrax. Television Newsfeeds: A national TV newsfeed will be made available prior to, and on competition days throughout the Billabong ASP World Junior Championships fuelled by Monster Energy. In addition, a single international TV feed will be made available following the final. About ASP: The Association of Surfing Professionals (ASP) is the governing body of professional surfing. Crowning surfing’s undisputed world champions since 1976, the ASP sanctions the following tours: the ASP World Tour, the ASP Women’s World Tour, the World Qualifying Series (WQS) and the World Longboarding, Junior and Masters Championships. The ASP is dedicated to showcasing the world’s best surfing talent in a variety of progressive formats and has revolutionized the way the world watches surfing via their webcasts. The organization is divided into seven different regions: Africa, Japan, Australasia, Europe, Hawaii, North America, and South America. PIPELINE, Oahu/Hawaii (Saturday, December 12, 2009) – Mick Fanning (AUS), 28, has been crowned the 2009 ASP World Champion, following a stunning performance at the Banzai Pipeline in Hawaii today (Saturday). Heading into the final stop of the 2009 ASP World Tour season, Fanning held the ASP ratings’ lead over life-long friend and fellow Gold Coast surfer Joel Parkinson (AUS), 28. Parkinson, needing to finish at least third in the Billabong Pipe Masters to overtake Fanning, suffered a Round 3 exit at the hands of wildcard Gavin Gillette (HAW), 23, handing Fanning his second ASP World Title. The 2009 ASP World Tour season will go down in history as one of the most dramatic, with Parkinson winning three of the first five events before Fanning rallied in the latter half of the season to overtake his good friend. For the first time since 2003, the ASP World Title came down to the final event of the season at the Billabong Pipe Masters. In the end, and reminiscent of Fanning’s 2007 ASP World Title (clinched in Brazil), the lightning-fast natural-footer was in the water with Parkinson (in between heats) as the scene unfolded. The two lifelong friends embraced, exchanged words and paddled in separate directions. For securing the 2009 ASP World Title, Fanning has also been awarded a bonus $50,000 from the Vans Triple Crown – Triple Threat prize-pool. Triple Threat bonuses of $50 000 will also go to the winner of the Billabong Pipe Masters, taking his earnings to $90 000, and to the overall winner of the Vans Triple Crown series, an ASP specialty series, who also receives the Nixon WTA award of a $10 000 custom timepiece. Following his clinching of the 2009 ASP World Title, Fanning, who had easily defeated Hawaiian wildcard Torrey Meister in Round 3, fell to Dean Morrison (AUS), 28, in the opening heat of Round 4 to finish equal ninth in the event. The three South Africans in the Billabong Pipe Masters were all eliminated in their opening encounters. David Weare (Durban) was ousted by Hank Gaskell (HAW) in Round 1, veteran Greg Emslie (East London) was sidelined by Phil MacDonald (AUS) in Round 2 and Jordy Smith (Durban) fell to Dayyan Neve (AUS) in Round 3. Emslie, who turned 33 two weeks back, has announced his retirement from professional surfing after spending a total of nine years campaigning on the ASP World Tour and accumulating more than $600 000 in prize-money. While the 2009 ASP World Title has been decided, the 2009 ASP World Tour season is far from over with one more day of competition remaining at the Billabong Pipe Masters. Rounds 3 and 4 were completed in classic 2-3 metre waves that produced four perfect 10 point rides at Pipeline today. Eight surfers remain in contention for the event title. Surfline, official forecasters for the Billabong Pipe Masters, are calling for conditions to drop slightly but remain clean for tomorrow. Event organizers will reconvene at 6:30am to assess conditions for a possible 8am start (8pm SA time). PIPELINE, Oahu/Hawaii (Thursday, December 10, 2009) – Round 1 of the Billabong Pipeline Masters, Event No. 10 of 10 on the 2009 ASP World Tour, commenced today in clean six-to-ten foot (2 – 3 metre) waves at the Banzai Pipeline. The third and final event in the Vans Triple Crown (an ASP Specialty Series), the Billabong Pipeline Masters plays host to two dramatic story arcs: the showdown for the 2009 ASP World Title and the requalification race for the 2010 ASP Dream Tour. Amidst the world’s best surfers exists a spattering of Pipeline specialists, making the competition field particularly challenging to navigate. Michael Picon (FRA), 30, current ASP World No. 39, is in need of an impressive result in the final event of the year to secure his position amongst the world’s elite in 2010. Today, the Frenchman put the rest of the draw on notice, first eliminating wildcard Manoa Drollet (PYF) before posting the highest heat total of the event, a 19.76 out of a possible 20, for a brilliant backhand tube-riding approach to take out Josh Kerr (AUS), 25, in the final heat of the day. To vault himself ahead the current qualification cutoff point, Picon will have to finish third or better at the Billabong Pipeline Masters, but the calculated Frenchman remains calm heading into the remainder of the event. John John Florence (HAW), 16, the Billabong Pipeline Masters’ youngest competitor, was a tour du force in his Round 1 heat, posting an impressive 17.20 out of a possible 20, to defeat fellow Hawaiian wildcard Danny Fuller (HAW), 27. Florence will take on current ASP World No. 27, Heitor Alves (BRA), 27, in Heat 12 of Round 2 when competition resumes. Andy Irons (HAW), 31, former three-time ASP World Champion and former four-time Pipe Master Champion, showed a return to form today recovering from an early heat double-interference collision with opponent Marcus Hickman (HAW), 30, and rallying with a dominant performance in the Backdoor righthanders. 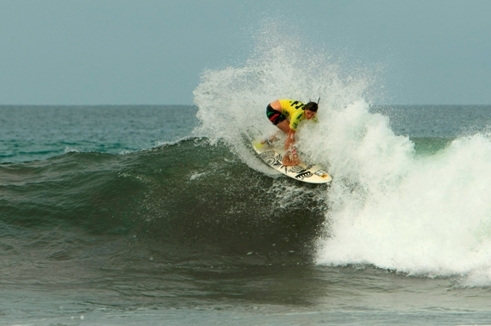 Although on sabbatical from full-time competition this season, Irons’ return to the ASP World Tour in 2010 has been highly-anticipated by the surfing world. Irons will take on current ASP World No. 25, Drew Courtney (AUS), 30, in Heat 16 of Round 2 when the Billabong Pipeline Masters recommences. Andy wasn’t the only Irons to make a dent in today’s competition as younger brother and former ASP World Tour campaigner, Bruce Irons (HAW), 30, took down lethal Californian Tim Reyes (USA), 27, in Round 2 of competition. Torrey Meister (HAW), 21, wildcard into the Billabong Pipeline Masters, was the first alternate called to action when Sunny Garcia (HAW), 39, failed to show for his Round 1 heat. Despite arriving late to the lineup, Meister put in an inspired performance in both the Backdoor rights and the Pipeline lefts to net a 16.83 out of a possible 20 to overtake Nic Muscroft (AUS), 27. Meister will face current ASP World No. 16, Kai Otton (AUS), 29, in the first heat when competition resumes. Wednesday, December 10, 2009 – In a massive boost for women’s surfing in South Africa, both Nikita Robb and Rosanne Hodge have qualified for the 2010 ASP Women’s World Tour giving the country two representatives at the highest level of women’s competition surfing for the first time since the two-tier system was introduced in 1992. Hodge , 22, qualified for her fourth consecutive year on the Dream Tour when she finished No. 10 on the yearend ASP Women’s World Tour rankings after the completion of the Billabong Pro Maui in Hawaii yesterday. The East Londoner, ranked No. 9 going into the final event, spent an anxious 24 hours awaiting the outcome when she was eliminated in Round 3. Rebecca Woods (AUS) overtook her in the ratings by advancing to the quarterfinals, but the balance of the lower ranked opponents were eliminated and Hodge clinched the last automatic re-qualification spot and a place amongst the world’s best competitive female surfers for yet another year. Robb, 20, also from East London, has been waiting for confirmation of her spot among the elite of women’s surfing since the final event on the 2009 ASP World Qualifying Series (WQS) in Ro de Janeiro in October. A fifth place in that event saw her jump to No. 9 on the yearend WQS rankings where the top six qualify for the top-tier World Tour. However, three of the girls ranked in the WQS top six were also competing on the World Tour and could double-qualify if they stayed in the top 10 on the Dream Tour, with their WQS spots then going to the girls ranked Nos. 7, 8 and 9. Coco Ho (HAW) and Paige Hareb (NZL) were comfortably placed on the World Tour rankings and Robb’s fate lay in the performance of Rebecca Woods (AUS) in the final event. Robb’s heart must have sunk into her heels when Woods was relegated to a cutthroat, sudden-death Round 2 heat after placing third in her opening match-up in Maui. And even more so when Woods appeared to be struggling in the Round 2 encounter. But Woods rallied and snatched second place by a miniscule 0.20 of a point and then went on to defeat former ASP World Champion Chelsea Hedges (AUS) in Round 3, cementing her No. 9 ranking and enabling Robb to take her place in the highest flight in 2010. Robb becomes only the third South African female surfer to reach the highest echelons of the women’s world surfing after Heather Clark (Port Shepstone) and good friend and fellow East Londoner Rosanne Hodge. Next year will be her first outside the Pro Junior (U20) ranks where she secured a number of international event victories and accolades and a string of national titles. HONOLUA BAY, Maui/Hawaii (Wednesday, December 9, 2009) – Stephanie Gilmore (AUS), 21, took out the final stop on the 2009 ASP Women’s World Tour today, the Billabong Pro Maui, in clean four-to-six foot (1.5 metre) conditions at the iconic pointbreak of Honolua Bay over Sofia Mulanovich (PER), 26, clinching her third consecutive Billabong Pro Maui title after three years of competition at the premier event. Gilmore wrapped up her dominating season amongst the Top 17 by claiming her second consecutive Vans Triple Crown title today as well. Gilmore capped the year off in appropriate form after claiming her third ASP Women’s World Title at the Gidget Pro Sunset Beach, when she advanced over Sally Fitzgibbons (AUS), 18, in the Semifinals, en route to defending her flawless record at the Billabong Pro Maui while claiming the prized Hawaiian specialty series and the beefed up $25,000 prize purse supplied by Vans. Gilmore absolutely dominated the day’s proceedings, blitzing the highest heat total of the entire 2009 ASP Women’s World Tour season by surfing a near-perfect heat of 19.67 out of 20 to usurp Samantha Cornish (AUS), 29, in her Quarterfinals heat before topping Fitzgibbons and Mulanovich en route to her second ASP Women’s World Tour win of 2009. Mulanovich campaigned through a lengthy day of competition, topping Jessi Miley-Dyer (AUS), 23, Australian veteran Rebecca Woods (AUS), 25, and ASP Women’s World No. 2 Silvana Lima (BRA), 25, but was unable to top Gilmore for the victory and claimed a runner-up finish at the final event of the year to finish her season ASP Women’s World No. 3. Fitzgibbons navigated the Honolua Bay lineup with poise and maturity beyond her years and posted some amazing scores before falling in her Semifinals bout against Gilmore, but clinched an impressive heat victory over Coco Ho (HAW), 18, in the Quarterfinals on the way to her third place finish. Lima, who smashed one of two perfect 10-point rides during the Billabong Pro Maui with amazing barrel riding in yesterday’s action, was in stellar form for the final day of competition, but was overtaken by former Peruvian ASP Women’s World Champion, Mulanovich, in the dying minutes of their Semifinals heat, taking a third place finish to wrap up her year while finishing ASP Women’s World No. 2 for 2009. 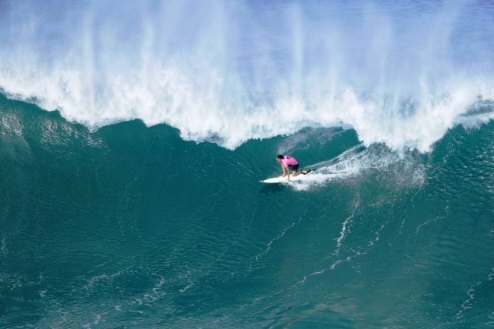 WAIMEA BAY, Oahu/Hawaii (Tuesday, December 8, 2009) – After 25 years with most of those spent waiting, Waimea Bay delivered an event of legendary proportions today at the Quiksilver In Memory of Eddie Aikau, Fueled by Monster Energy. It was 25 years to the day since the first “Eddie” was held and waves of up to 50 feet poured in to Oahu’s North Shore as if on cue. 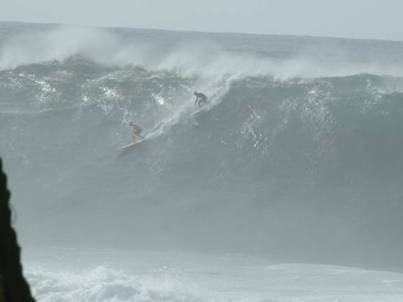 With younger brother Clyde still in the lineup, at age 60, joined by the contemporary top guns of big wave riding, a packed arena celebrated every gutsy ride in brilliant sunshine befitting of a tribute to local hero Eddie Aikau. When all was said and done, it was California’s Greg Long, 26, (California) who made a late charge in the final heat of the day to claim the $55,000 winner’s purse. Long committed to an unbelievable never-say-die attack, securing all four of his top scores – several of them death-defying and one of them a perfect 100-point ride, in macking 40- to 50-foot waves. It was the high point of his career to-date – pretty incredible given that he only rode Waimea for the first time this week. Grant ‘Twiggy’ Baker became the first South African to compete in the legendary big wave event and rode the first wave of the day in Heat 1. The Durbanite went on to finish 15th overall. Nine-time ASP World Champion Kelly Slater (Florida, USA), who won here back in January of 2002, placed second after leading the score board from the second heat of the day. Long turned the tables on him in the final hour of competition. All Slater could do was look on in as much disbelief as the frenzied crowd who were at that point ready to celebrate with anyone. Slater earned $10,000. Third was Hawaii’s Sunny Garcia, earning $3,000. Fourth was defending Eddie champion Bruce Irons (Kauai), $3,000. Tuesday 8 December 2009 – South Africa’s Travis Logie has qualified for the 2010 ASP World Tour, professional surfing’s highest level of competition, after a gruelling campaign that saw him finish No. 13 in the yearend ASP World Qualifying Series (WQS) rankings. Logie, who spent four years amongst the world’s top 45 ranked surfers before dropping of the Dream Tour at the end of 2008, went into the final two WQS events in Hawaii ranked No. 11 and needing to advance through one heat to ensure his spot in the Top 15. Elimination in his opening heats in both events left the 30-year-old Durbanite waiting on the sidelines as first Tanner Gudauskas (USA) and then Dusty Payne (HAW) overtook him. But the rest of his closest rivals were ousted in the subsequent rounds at Sunset Beach and Logie secured a well deserved place back at competitive surfing’s top table. Logie’s commitment to re-qualifying saw him compete in 21 of the 41 events on the 2009 WQS, the highest number by a South African and a total matched by only four of the nearly 1 000 other WQS members worldwide. He clinched a confidence-boosting victory in a 2-Star rated event in Australia early in the campaign before netting his biggest points haul in his home town when he placed 5th in the 6-Star Prime rated Quiksilver Pro Durban in April. ASP World Tour title contenders Joel Parkinson and fellow Australian Mick Fanning along with Hawaiians Sunny Garcia and Dusty Payne fought out the final of the 6-Star rated O’Neill World Cup of Surfing in tricky 3 – 4 metre waves at Sunset Beach. Garcia, the 40-year-old veteran chasing a record 7th Vans Triple Crown of Surfing, opened his account with an incredible tube ride than earned him 9.47 points out of a possible 10 but could not find a second high scoring ride. Parkinson clinched victory with rides of 7.0 and 6.17, matching Hawaiian legend Michael Ho’s record of three wins in the World Cup, and rocketed into the lead in the Triple Crown ratings, which he won last year. Garcia held on for second place in the event, which earned him a wildcard into the Billabong Pipeline Masters, with Fanning third and Payne a distant fourth. Damien Fahrenfort posted the best results by a South African in the event, winning his opening encounter and then recording the highest heat total of Day 3, and the sixth highest total of the entire event – 16.27 out of 20 – before being ousted in the Round of 64. Brandon Jackson went into the Hawaiian leg rated No. 15 on the WQS and in contention for an ASP World Tour spot. Like Logie, Jackson could not advance out of his first heats at Haleiwa and Sunset and dropped to No. 24 in the yearend rankings, which will give the 22-year-old from Durban North excellent seeding for the WQS contests in the first six months of 2010. Royden Bryson (Cape Town) advanced through one heat at Haleiwa and none at Sunset to end the year ranked No. 36. Fahrenfort came in at No. 67 and Rudy Palmboom (Bluff), who won both his opening match-ups in Hawaii but was then eliminated in the Round of 96, closed his 2009 campaign rated No. 81. After nine events on the 2009 ASP Dream Tour, the race for the ASP World Title will culminate in a showdown between two lifelong friends at the final event of the season, the Billabong Pipeline Masters, which will also decide the Vans Triple Crown of Surfing, from December 8 – 20, 2009. Mick Fanning, 28, former ASP World Champion (2007) and current ASP World No. 1, will face Gold Coast stable mate and current ASP World No. 2, Joel Parkinson, 28, in the hunt for the 2009 ASP World Title as the two battle a minefield of the world’s best surfers and Pipe specialists at the Billabong Pipeline Masters. 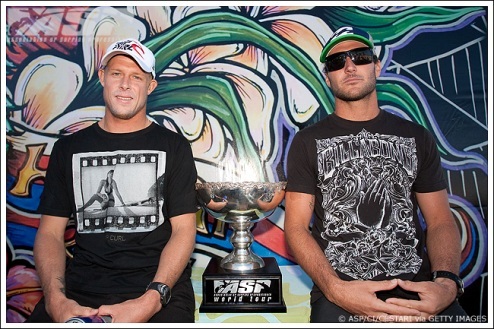 While the rest of the Top 45 fight for ratings points and prize-money and the 16 Pipeline specialists battle for prestige, only Fanning and Parkinson can win the 2009 ASP World title, with Parko having to finish two places ahead to overtake the current No. 1. Jordy Smith, the current ASP No. 10, has been seeded into Round 3 of the event and will be going all-out to improve his yearend ranking. A top 8 finish in the ratings will see the 21-year-old Durbanite guaranteed of preferential seeding for the entire 2010 season while a top 5 place will earn significant performance bonuses from his sponsors. Greg Emslie, rated No. 31 and just 137 points shy of the No. 27 spot that will automatically qualify for the 2010 Dream Tour, starts in Round 2. The East London based veteran campaigner needs to advance to Round 3 to have any chance of an incredible 10th year in the top fight, while progressing to the last 16 will probably ensure him of a spot. David Weare occupies the No. 41 position and still has a mathematical chance of requalifying. But the Durbanite starts in Round 1 against Pipe standout Hank Gaskell, who won the Xcel Pro at Sunset Beach last month, and Weare faces the daunting task of having to place first or second at Pipeline to move into the Top 27 in the rankings. All the action from the Billabong Pipeline Masters can be followed live at www.billabongpro.com starting at 8pm (SA time) daily. The massive swell currently pounding the North Shore of Oahu has scoured all the sand off the Pipeline Reef which should produce epic waves for the event. While the waiting period starts today and runs until 20 December, it is unlikely that the event will get underway before the swell starts to drop on Thursday. See www.aspafrica.com for more details on the Billabong Pipeline Masters, including the draw for the first three rounds. The Billabong Pro Maui presented by Hawaiian Airlines will kick off the event’s 13 day waiting period tomorrow and the globe’s finest 17 competitive female surfers will take on Maui’s famed righthand pointbreak of Honolua Bay to do battle for the Vans Triple Crown title as well as the valuable ratings points towards requalification for the 2010 ASP Women’s World Tour. Stephanie Gilmore (Australia) has already clinched an unprecedented third straight ASP Women’s World Title in just her third year on the tour and Hawaiian teenager Alana Blanchard leads the Triple Crown ratings. South African eyes will be focused on Rosanne Hodge, 22, from East London who is currently ranked No. 9 and needs to finish in the Top 10 on the yearend leaderboard to requalify for a fourth successive year on the ASP Women’s World Tour. Hodge has finished third and fifth in her last two years in this event and needs to stave off the challenge of the eight girls currently ranked behind her to remain at the highest level of women’s surfing. Attention will also be on the performances of Coco Ho (HAW), Paige Hareb (NZL) and Rebecca Woods (AUS). If that trio all end in the Top 10 in the yearend rankings, then South Africa’s Nikita Robb, who finished the year ranked No. 9 of the Women’s WQS, will qualify for her first year on the ASP Women’s World Tour, potentially giving SA two representatives on the Women’s Dream Tour for the first time since it was introduced in 1992. All the action can be followed live at www.billabongpro.com/maui09/ and the waiting period runs from today until 20 December. 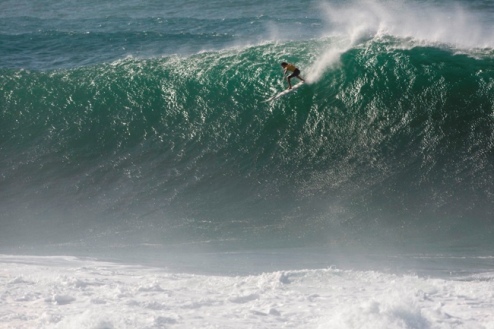 The Quiksilver In Memory of Eddie Aikau, fueled by Monster Energy, the only big wave contest to be sanctioned by the Association of Surfing Professionals (ASP), is set to run at Waimea Bay in Hawaii today as mammoth waves in the 8-13 metre range (25-40 foot) batter the North Shore of Oahu in Hawaii. Featuring 28 selected invitees, including South Africa’s Grant ‘Twiggy’ Baker, and 26 alternates, all drawn from amongst the world’s best big wave chargers, the ‘Eddie’ honours the memory of legendary Hawaiian surfer and lifeguard Eddie Aikau. The Billabong Girls Get Out There Summer Tour hits the beaches of South Africa again this December, bringing its patented formula of fun in the sun, the healthy outdoor lifestyle, plenty of activities and heaps of give-aways and prizes to coastal towns in KwaZulu-Natal and the Eastern and Western Cape. The 12-day, eight-stop tour starts in Ballito on 12 December with the Billabong surf team-riders and brand ambassadors traveling the length of the coastline introducing girls of all ages to the fun-loving lifestyle that includes learn-to-surf lessons, creative workshops, Yoga sessions and other energising activities. Well known TV personality Marius Roberts will be presenting the beach activities as the tour also visits the premier holiday destinations of Umhlanga, Margate, Port Elizabeth, Plett, Mossel Bay, Big Bay and Camps Bay. The activities on the Billabong Girls Get Out There Summer Tour are all absolutely free and girls countrywide are invited to bring their friends and family to the beach to enjoy the lifestyle, meet and mingle with SA’s surf stars and participate in the action. The Neutrogena Surf School offers learn-to-surf lessons every hour, on the hour, using fully accredited surf instructors and all the necessary equipment at each stop on the tour. Sign up at the Neutrogena gazebo on a first-come, first-served basis and all participants’ names will be entered into the lucky draws for Neutrogena product hampers. Bevcan are driving the message that cans are cooler, lighter, stronger and less dangerous than glass on our beaches! Come and have fun on their giant inflatable slide and enter their competition to stand a chance of winning a specially designed surfboard at each event! Seventeen Magazine is focusing on all the things girls just love and have their portable photo booth where they will make you feel like a cover model! And there will be a creative area set up where girls can express their imaginative, original and artistic talents with paints on canvas or with beading. Meet our Billabong Girl Surf Team and our Billabong brand ambassadors as they hit the beach to get you on film enjoying yourselves – all the fun and best moments will be uploaded onto Billabong.com, Facebook and YouTube and you may even get to see yourself on Vuzu TV (DSTV Channel 123). The Billabong Girls Get out There Summer Tour is coordinated by Magnetic Events and proudly supported by Neutrogena, Bevcan, Seventeen, FNB, Vuzu, Sony, Von Zipper, Kustom and Nixon. HONOLUA BAY, Maui/Hawaii (Monday, December 7, 2009) – With a massive swell expected to tackle the Hawaiian Islands, the Billabong Pro Maui presented by Hawaiian Airlines will kick off the event’s 13 day waiting period tomorrow and the globe’s finest 17 competitive female surfers will post up at Maui’s famed righthand pointbreak of Honolua Bay to do battle for the Vans Triple Crown title as well as the valuable ratings points towards requalification for the 2010 ASP Women’s World Tour. Alana Blanchard (HAW), 19, has been on a hot streak throughout the Vans Triple Crown series, taking out the Vans Hawaiian Pro at Haleiwa before taking fourth place at the Gidget Pro Sunset Beach. The impressive back-to-back results posted by the ASP Women’s World Tour rookie currently see her atop the Vans Triple Crown series and Blanchard will need to stay consistent at the upcoming Billabong Pro Maui to take out the prestigious series. Coco Ho (HAW), 18, current ASP Women’s World No. 3, has had a sensational season while competing in her rookie year amongst the international field that make up the ASP Women’s World Tour. The talented regular-footer has been the only rookie thus far to claim an event victory in 2009 and is hoping she can end her season with another solid result on Maui. Ho, who hails from an impressive bloodline of champion Hawaiian surfers, is still relatively new to Honolua’s reeling right-handers, but is looking forward to capitalizing on the solid forecasted swell which is expected to produce solid waves for the upcoming Billabong Pro Maui. PIPELINE, Oahu/Hawaii (Sunday, December 6, 2009) – After nine events on the 2009 ASP Dream Tour, the race for the ASP World Title will culminate in a showdown between two lifelong friends at the final event of the season, the Billabong Pipeline Masters from December 8 – 20, 2009. Mick Fanning (AUS), 28, former ASP World Champion (2007) and current ASP World No. 1, will face Gold Coast stable mate and current ASP World No. 2, Joel Parkinson (AUS), 28, in the hunt for the 2009 ASP World Title as the two battle a minefield of the world’s best surfers and Pipe specialists at the Billabong Pipeline Masters. Although Parkinson mounted an impressive assault throughout the first half of the year, an ankle injury sustained while training in Bali saw the Australian’s lead dwindle before being overtaken by Fanning, who has won three of the last four events. If Fanning’s incendiary performances this season are any indication, the lightning-fast natural-footer will be a force to be reckoned with heading into the final event, but Pipeline’s elusive and at-times dangerous nature will ultimately decide the victor. Although Fanning possesses a solid ratings’ lead, Parkinson remains collected heading into the final bout of the year, and will draw upon his preternatural affinity with the wave at Pipeline to put forth his best effort. 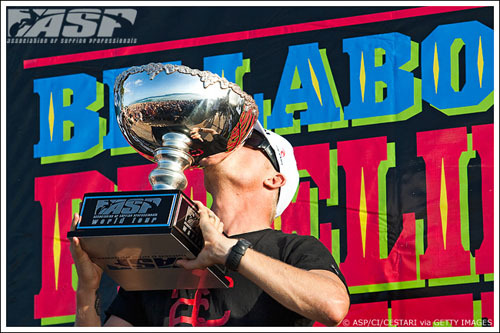 In addition to hunting down his inaugural ASP World Title, Parkinson is also out to defend his Vans Triple Crown Title – a feat made easier with an emphatic win at Sunset Beach yesterday. – Fanning finishes 33rd through a 9th at Pipeline, Parkinson needs a 3rd or better to overtake. – Fanning finishes 5th at Pipeline, Parkinson needs a 2nd or better to overtake. – Fanning finishes 3rd at Pipeline, Parkinson needs win the event to overtake. – If Fanning finishes 2nd or better at Pipeline, he will clinch the 2009 ASP World Title. Surfline, official forecasters for the Vans Triple Crown, are projecting for the current fetch of 20-25 foot surf to build through tomorrow before declining over the next several days. Event organizers will convene tomorrow at 6:30am to assess conditions for a possible 8am start.